unnecessary – especially with today’s rental inventory surplus. Don’t be coaxed into having to pay anyone to lead you to any special deals – because they’re out there for everyone to partake; it just takes a little effort on your part to find them. Almost everyone is online today; even those in the most remote valleys and hilltops can seem to get access, especially with mobile Internet connections. There appears to be an endless list of rental property listings, roommate services, subletting websites and vacation rentals available, including Rent.com and others. The classifieds section of the newspaper is still a great source for rental property. There is one downside, however, for those who are looking for a lower priced unit in heavily circulated newspapers (100,000+ subscribers), because the cost of the ad may not be worth the effort for lower rent landlords unless it is a multi-unit apartment complex. Smaller local newspapers, on the other hand offer, offer not only affordable advertising for landlords, but also usually a more targeted search area for tenants. There are two types of real estate agents that can help you. The first is one who operates a property management business. These are licensed professionals that represent rental property owners to ensure the unit is marketing when vacant and looked after when occupied. The real estate agent usually charges a monthly percentage to the property owner (10% on average). 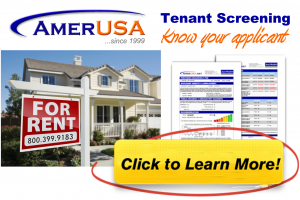 Fortunately, there is no cost to you – except they may charge you an application fee ($25 to $50 in most areas) to cover their tenant screening costs (i.e., for a credit report, criminal background check and/or an eviction search). The second type is referred to as a tenant placement agent. These real estate agents generally don’t do many sales – their money is made by receiving a commission if they are able to bring a qualified tenant to a landlord. Once again, there is no cost to you to have them find you a place to rent. However, you may have to pay a minimal application fee to apply. The landlord usually compensates the agent anywhere from a few hundred dollars all the way up to the equivalent of an entire month’s rent if you qualify and execute a lease agreement.